Price: Cheap & Cheerful: Between $20 and $30 per person. BYO wine only. I have said it before, but this blog is not at all cutting edge. For years, lots and lots of more qualified people* than me have raved and ranted about Hu Tong Dumpling Bar. This would ordinarily stop me from adding yet another review to an already overcrowded space. (*In particular there are some great reviews by Tummy Rumbles, MEL: HOT OR NOT and, especially for vegetarians, Where’s The Beef). However, after many (far too many in fact) late night dumpling sessions, I think I have identified the perfect order for a 4 person dinner at HuTong and feel compelled to share my discovery. 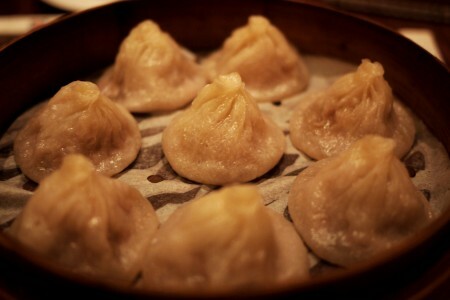 First and foremost, you simply must order the steamed Xiao Long Bao (AKA: The Soup Filled Dumplings). The smooth white dumpling skin, hides an amazing soup filled centre – which bursts and creates a flavour explosion in your mouth on the first bite. The Xiao Long Bao come served with a side of very finely julienned ginger, which cuts through the richness of the pork flavored soup and adds some lovely freshness and texture to this dish. Safely gobble up the remainder of the dumpling (which, if you have followed steps 1 and 2 above, should now be soup explosion free). Next up, I would recommend a more substantial dish. My preference is the Beancurd with Minced Pork (Ma Po Tofu), which never fails to remind me of home as this was one of The Mother’s favorite dishes while I was growing up. The HuTong version of this dish is very generous, with lots of spicy bean paste and chilli. 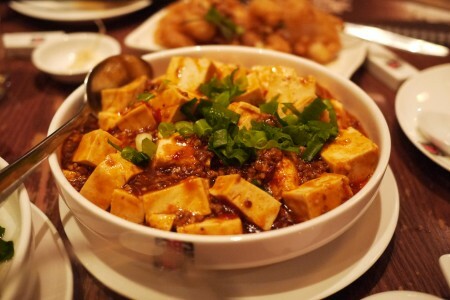 The tofu is soft and silky – the perfect vessel for the deep red chilli sauce. 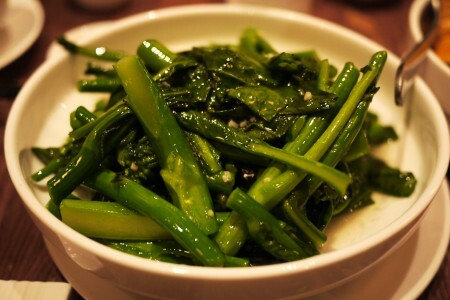 A generous sprinkling of spring onions and some freshness and lightness to the dish. If you are dining with vegetarians, ask the kitchen to hold the minced pork and this makes a cracking meat-free dish too. 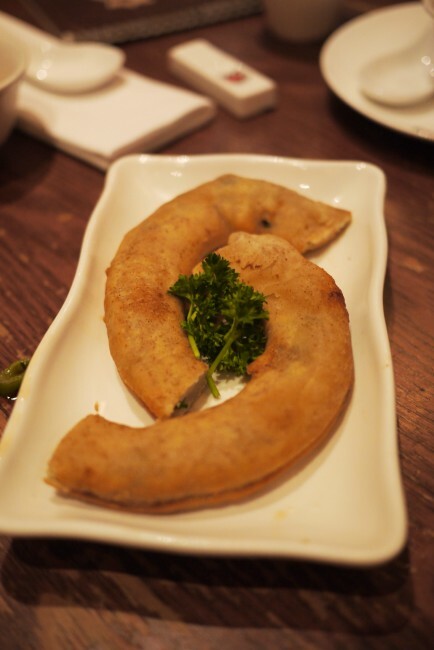 If like me, you find yourself craving dumplings after one too many G&Ts on a Friday night, I strongly recommend indulging in a little restorative deep fried, goodness and the Spring Onion Pancake certainly fits the bill. It is crisp, salty and (I believe) assists in hangover prevention the next day. Make sure you dip the Pancake in lots of hot chilli sauce for that extra kick. If you want even more deep fried goodness, I also recommend the Salt and Pepper Squid. The batter is nearly always* crisp and golden, encasing tender squid within. The Squid comes served with lots of fresh chilli, coriander and golden fried shallots and garlic . Every mouthful is crunchy, flavour packed and deliciously unhealthy. 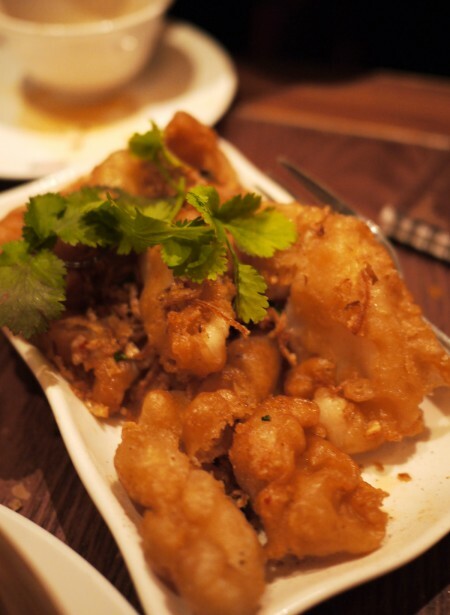 (I have only had to send the Salt and Pepper Squid back to the kitchen at HuTong on one occasion when the batter was under-cooked and gluggy. The kitchen were more than happy to replace the dish though and the second attempt was gloriously crisp and golden). 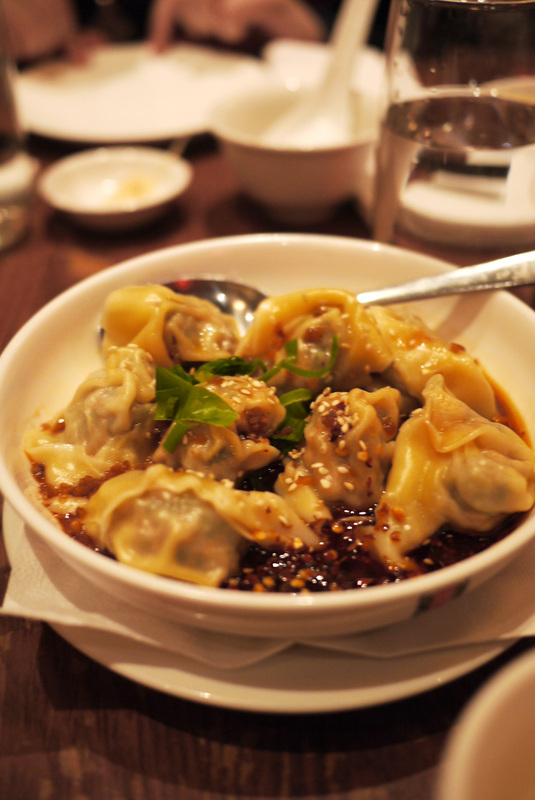 While on the theme of chilli, my favorite dumplings at HuTong are the Wontons with Hot Chilli Sauce. The smooth, steamed wontons are drenched in a sweet, tangy and hot dark sauce, filled with chilli, soy sauce and rice wine vinegar. Fresh spring onions are then sprinkled on top, adding some crunchy freshness to each bite. The addition of roasted sesame seeds also adds a subtle nutty flavour and texture to each bite. The Pan Fried Dumplings at HuTong are quite unique in that rather than simply pan frying individual dumplings, the entire base of the pan is spread with an incredibly thin layer of dumpling skin, resulting in a very fancy looking plate of dumplings. 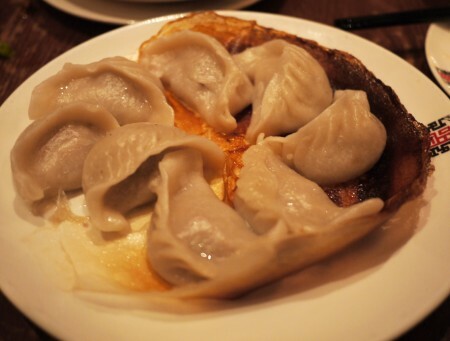 The pan fried dumplings are filled with a simple pork and vegetable filling. The filling is generous, moist and very moreish. If you feel the need to break up all of these carbohydrate laden dumplings with some greenery, skip the pickled vegetables - definitely not sour or sweet or crunchy enough to qualify as real pickles in my mind – and head straight for the the Chinese Broccoli (Gai Lan) with garlic. A very simple, yet satisfying flavour combination. Putting on my lawyer hat for just a minute, I will end with this legal disclaimer - while the dumplings are good, service can often be appalling! The last time I tried to make a group booking on short(ish) notice I was told that my group could come in at “9.30pm or never”. Just think of head honcho at HuTong as the Melbourne’s own version of The Soup Nazi. Good luck getting a table! The Doctor: Since you’re a doctor, I’ll just have to take your word for it.